Green Dog Pet Supply - Kongs Are So Useful For Holidays! Posted November 13, 2018 by greendog & filed under anxiety, behavioral tip, Products We Love. We know you know about Kongs (don’t you wish you’d invented them?) but we’d like to remind you that when your house is full of busy activities, and you have an irregular schedule and visitors, it can cause anxiety for the pets in the home. 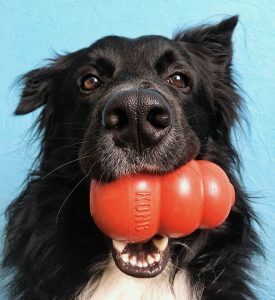 For dogs, one great calming activity can be working on extracting delicious foods from a Kong, and it has the added benefit of keeping them busy and therefore not underfoot. Chewing is also work, so Kongs can help on days when you just don’t have time to really run the dogs around as much as you’d like. Kongs are one of the safest chews to give a dog, as they are made from natural rubber, are too large to swallow and are a good size to hold onto with their paws. Most people only think of smearing a bit of peanut butter inside, but you can be creative with other whole food Kong fillings to make them last longer and be even more appealing. (We don’t love the ingredients in the commercial fillings). Moist foods like plain yogurt, cooked sweet potato, a little cultured cottage cheese, banana, unsweetened applesauce, canned dog food, Green Juju or other finely minced greens/veggies, part of her regular serving of kibble can be stuffed into the Kong and frozen to make them last much longer ((you can soften it first in either water, fermented raw goat’s milk, or bone broth). 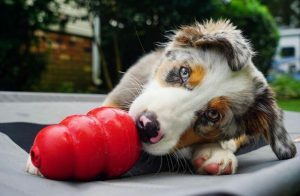 – Pick out a Kong that’s big enough for your dog’s tongue to reach inside and lick out the fillings. – If you have a puppy, pick out a bigger one knowing they will grow into it but don’t load it all the way up with a full big Kong’s worth of food. It might be too much food. Remember that food can stimulate the need to poop for your puppy, so if you feed with a Kong in a crate, check on them before too long to take them out for a potty. – For hard-chewing dogs, the black colored Kongs are even stronger than the red color.